The old clock always knew where it was going. Not us. We didn’t know we would uproot our lives in the city and move to the San Juan Islands. And we didn’t know what the house would be until we came home with a 9 1/2 foot yew log for a mantle and didn’t want to cut it down. But when we realized that a rock wall would be best behind it, it was decided then, I think, the house would go Lodge Style. From that moment on I looked for rustic furnishings and rugs. Our hardwood floors were already distressed. Like a dock, I thought at the time. It was summer then, and I was thinking along the lines of a beach house. But in moving over to Lodge Style, everything worked in concert. Including all our “nicer things:” candelabras, linens, chandeliers, art and books. 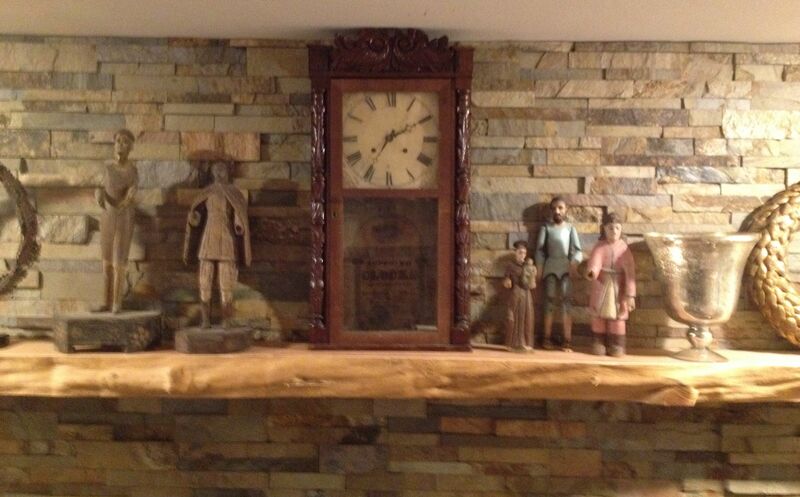 And an heirloom of mine, an eight day time and strike mahogany shelf clock, circa early 1800’s. Today, the heartbeat of the house. So tightly wound in its packing crate, it started ticking when placed upon the mantle. That’s why I say the old clock always knew where it was going. Give me a day like this and I re-appreciate passing time. The season is turning and we will all be coming out of the darkness like moles. The sun is something we’ll have to adjust to again. It all rushes back to me: light filled days and nights, how awake we will be, and what we can accomplish. Soon we’ll drop household projects and favor everything outdoors. What is done in the remodel will be done. Our priorities will shift. It will be far more important to hold the seawall, reinforcing it with logs and rocks. We will want to build another set of Adirondack chairs with ottomans for the upper deck, staining them in the sun. Pick up a picnic table, cook and eat alfresco. Vegetables to get growing; an old deer fence to reinforce first. Forage for clams, oysters and crab on the beach. Essentially we will live outside. Hang a hammock, and call it a day. The clock was certainly emotionally and physically resilient. It maintained it’s dignity, value and usefulness in spite of multiple rejections, longtime disinterest and intense storage. Glad it found such a perfect and respectful home. And hope it’s not a real life incident from the Twilight Zone. I know, right? No one wanted it, not even me at the time. I had to see the old clock in a new environment to appreciate it. The more I do homes, the more it comes down to the “right plant, right place” philosophy in landscaping. It’s the same thing. I had a similar experience, my Dad gave me a picture painted by my great grandmother, we took it to our French house and it went perfectly. Even with the peeling plasterwork of the house. I’m glad your clock found its true home and living outside in a hammock sounds idyllic. I bet you can’t wait.